The heavy rain of the first night left the camp site Las Dunas and the event beach wet for the morning hours of the second competition day. It was pretty obvious that all the cloud coverage would hold back the thermic wind from building already at noon, therefore the first tow-in qualification round was scheduled for 12.00h. 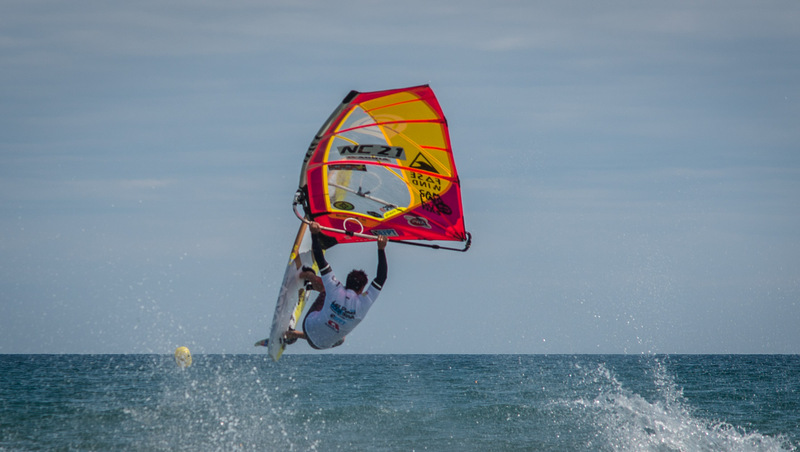 Like in many of the other events on tour the organiser, race crew and riders decided to run a tow-in competition besides the freestyle windsurfing dicipline during several sessions over the next days. Thursday and friday it is planned to run qualification heats and the final with the top 6 riders will be happening on the weekend depending on the weather conditions. 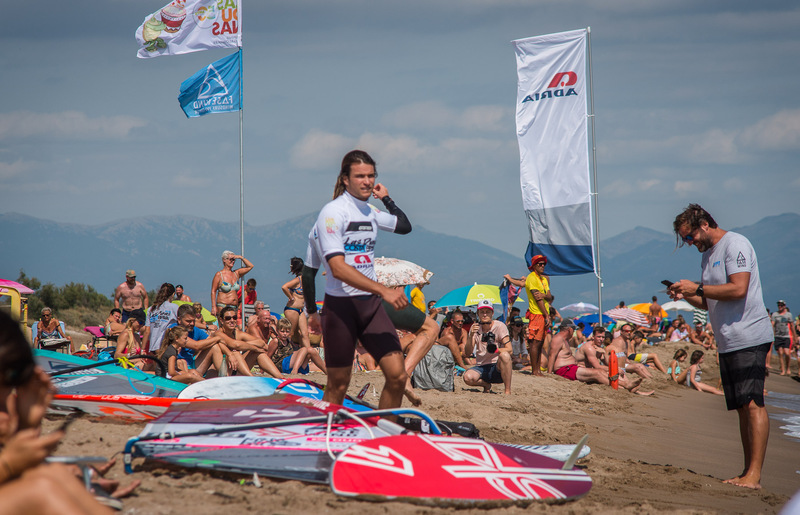 Around noon the the clouds slowly disappeared and with the sun heating up the sandy beach of Costa Brava, spectators filled up quickly and the stage was set for the first tow-in qualification heat. 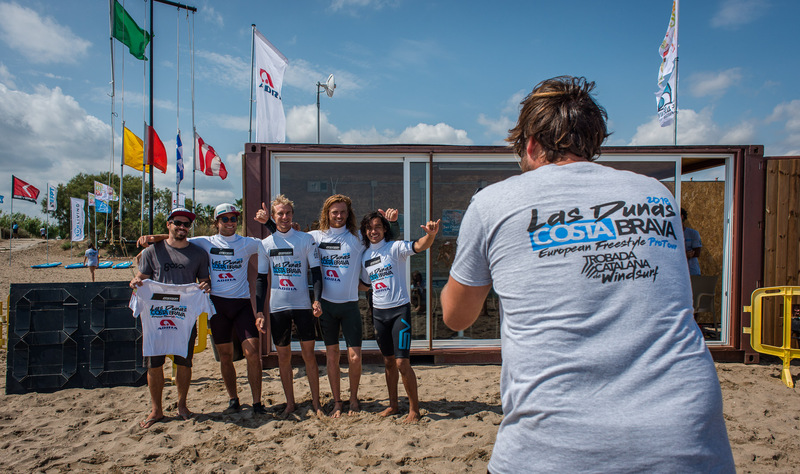 In this first heat up against each other were Adam Sims (Patrik/Sailloft) from the UK, Antoine Albert (Goya/Goya) from New Caledonia, Riccardo Marca (Fanatic/Duotone) from Italy, Valentin Böckler (Gun Sails) from Germany and Alex Mertens (Severne/Severne) from the USA. Everybody of them got 3 scored runs today with the best move counting and the top 3 guys of each group would qualify for the final. Should there be time for more qualification runs tomorrow, then everybody will get another 3 runs and the best 2 moves out of 6 total will count for the qualifying. With just a few knots of light onshore breeze and some nice small kickers on the sandbank, the conditions seemed to be fun for a tow-in session and after a few testruns to get the jetski trained on the right speed and course, it went straight into the scoring runs. First up was tow-in specialist Adam Sims who opened up the fight with his signature move, a clean Double Spock that got him rewarded with 8,34 points out of 10. Second rider was Antoine Albert, who countered with his own trademark move, a Skopu, landed clean and dry but could not complete the last 180° rotation and earned 7,34 points for that. The crowd was supporting the riders from the beginning on, cheering for the spectacular moves and crashes and after yesterdays taste of tow-in action, even more people gathered on the beach today to enjoy the show. These two first moves set the benchmark for this heat and could not get matched by any of the other riders coming after them nor themselves until the 3rd and last run of Riccardo Marca. On his last attempt he stomped a clean and powerful Air Burner 360, that gave him 7,41 from the judges and let him slip into second position just on top of Antoine with a marginal difference. So at the end of the first tow-in heat these 3 guys are sitting in the qualifying positions for the tow-in final on the weekend. During the afternoon the wind started to build more and more to the point that the riders of the first heat were put on standby around 14.30h, testing the conditions to start a freestyle heat anytime but the wind failed to materialise on a suitable level. Around 16.00h darker clouds took over the sky again, soon after the first rain drops come down and killed all hopes for running any freestyle heats as well as the second tow-in qualification heat, which got postponed for tomorrow. The forecast for friday and saturday looks a lot more promising for thermic winds with sunshine, so hopefully we can get the official freestyle competition run during the next 2 days. Action from the second day of the EFPT event at Camping Las Dunas in Costa Brava. Sims leads the way in the tow-in qualifications, with plenty more runs to go all can still change. Forecast looking favourable for the weekend. Stay tuned.